How do we encourage good “netiquette” among our students? I use that term as it pertains specifically to conversation that takes place online, but in truth encouraging positive, constructive discourse and conversation among learners is essential in all environments. I try to look past the distinction between commenting on a blog, and having a face to face conversation around a table, but there is a difference. The medium (blogs) are seen as cousins of typically more terse electronic modes of conversation; texts, messages, snapchats all encourage short, punctuated quips. Face to face conversation in a classroom is expected to be the opposite of that. So it was with great pleasure that I sat in the back of one of Melinda Boydston’s Tech Literacy classes at our middle school today. I try to make it a point to plant myself in a classroom and observe a few times a week to gather my thoughts, and see how students are interacting with technology. More importantly, it’s a good way for me to build some small, yet crucial connections with teachers and learners. I find myself asking questions along with the students, and getting some great tips and tricks for instructional practice. Sometimes the smallest of boxes are the hardest to fill up. In today’s case, Mrs. Boydston was helping students work on their commenting skills among their fledgling blogs that they’ve started on Kidblog. They had a brief discussion about etiquette in various social situations; around the dinner table, at school, in the hallways, etc. A few students shot a few snarky remarks her way, trying to throw her off her game, most of the comments being along the lines of “but what if I want to tell someone that his blog post was swag? !” Most students understand what Mrs. Boydston was talking about, and they all sort of agreed about how their “netiquette”, or how they behaved in their online learning environments, was very much akin to their “real world” learning environment. 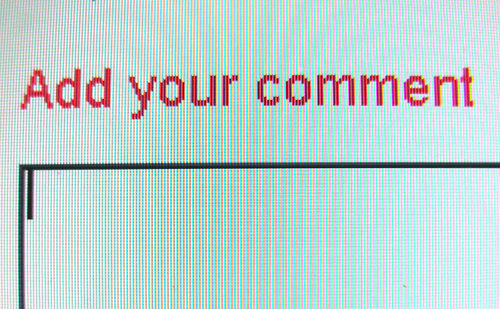 She wrapped up the conversation about commenting, and kept it simple; she wanted more than the “one word comment”, something that went beyond “awesome”. Which got me thinking. When you’re trying to combat the already anemic length and depth of electronic communications sent among students each day, what sort of questions and criteria do you give students to encourage them to go beyond awesome in their blog comments? William Chamberlain goes for the “blitzkrieg” approach, rallying his thousands of teacher and student Twitter followers to help add comments to freshly minted student blogs posts. With that many commentators, there’s bound to be plenty of comment gems among the rough. An older post from Meredith Stewart encourages groups of students to brainstorm “less useful” and “more useful” types of comments before clicking away at their keyboards. Although the digital remains are no longer found on the web, I used to require my 6th graders to ask 3 questions about what their peers were thinking about while writing their blog posts. You could even go old school, and diagram what makes a good comment with pencil and paper like Mrs. Yollis does (another oldie, but goodie blog post I keep bookmarked). With the rapid transition of student writing from notebooks to Google Docs and blogs within my district, I found myself incredibly curious today, wondering how well teachers’ traditional methods of getting students to craft well written comments are translating to digital writings. I’m going to make a mission out of gathering and culling together the most effective methods that teachers in my district have devised for helping students go beyond awesome with peer feedback, and will report back here in a few weeks. In the meantime, if anyone else out there has thoughts, links, or methods they find particularly useful at fostering good commenting skills in learners, please share. I love any and all strategies that still rely on paper to get learners started. It’s a nice way to force some comments through a slower methodical thought process before just clacking away at the keyboard. The time invested hopefully means students will want to make sure they have something worthy to say. I can’t wait to see the list that you come up with, Ben. To be honest, I’ve kind of been in mourning for the blog comment ever since Twitter was invented. Few people take the time to really jump in the comment section and share their thinking anymore — and I think that’s a loss for all of us. Hope it helps — and can’t wait to see what you pull together on this. I’ll probably get started on the list after all our state testing is over with in October, as I want to talk with the teachers after the stress of testing is gone and give myself some time to frame it in a cohesive K-12 framework. I LOVE the name of that blog, “Intercontinental Ballistic Reading Group”…sweet. Those tips are great! It’s been so long since I’ve kept a nice bag of teaching strategy tricks around like that, it’s time I started gathering them back up again.